This was received in an email. I just posted this and it said it was being moderated?!? Maybe this one was moderated earlier? 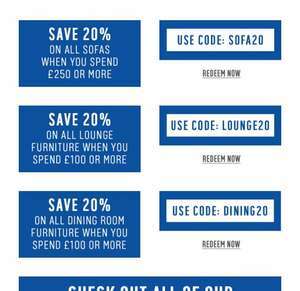 Trying SOFA20 with argos.co.uk/pro…518 and getting "Oh dear, your order is not eligible for this deal." Cancel that, it works if basket is over £250. £250 min spend. Voucher posting newbie! This is chronofighter first voucher post. Help out by leaving a posting tip or just to show your appreciation for their contribution.